57% of respondents to our February 2010 Employment Survey were full-time employees, and 21% were part-time. No respondents identified themselves as students with no other occupation, though 30% of respondents said they were still in school. In other studies, 46% of working students in the U.S. logged in at least 25 hours a week at their job, even to the detriment of their academics and the social aspects of university life (U.S. PIRG, 2002). 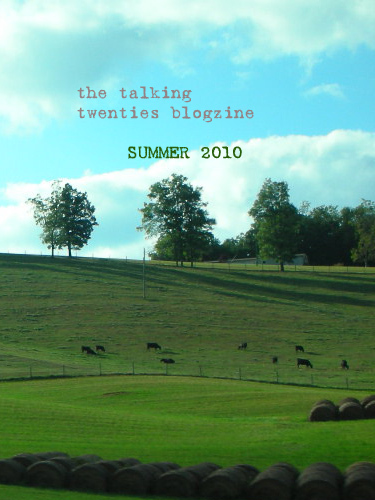 Welcome to our first-ever theme issue of The Talking Twenties Blogzine! Our topic this month, as you can see, is Higher Education. Let me talk a little bit about why this issue is so important, and give you some statistics (including a few from last month’s survey on employment). First of all, we’ve had a couple articles in the past that are pretty down on higher ed, the argument being that it doesn’t necessarily help graduates find a job. Sue_De_Nim, in January’s “The false promise of education,” wrote that the reminder of her student loans “sits on my shoulders with all the comfort of an albatross,” while Nak had previously expressed her own disillusionment with higher education, asking “Remember when you thought graduating from college would be awesome?” and stressing the importance of keeping your goals and expectations flexible in order to find employment and success rather than just relying on your degree (“Misconceptions,” February ’09). The bottom line of both articles is that higher education does not always equal a job, though colleges and universities traditionally lure us in with claims that they can give us the best start in our chosen field. But read between the lines of our gripes: graduates wouldn’t be quite so irritated if they had been in school just for the “college experience” and hadn’t done plenty of leg-work leading up to their graduation and employment search. In fact, 30% of our respondents from last month’s Employment Survey said they were either full or part-time students; and yet, when asked about their employment status, 0% of respondents answered that they were students alone! The college student who identifies him- or herself as only a student is surely of a dying breed, but at the same time we are reminded all too often of the old “perpetual student” stereotype, bolstered by a June 2009 article in University World News, which stated that less than 55% of college students in the U.S. are able to graduate within six years. When you hear that statistic alone, don’t you just think, even if only for a second, either “part-timers” or “slackers”? It is a misleading statistic, however: among the many students I met in my own academic career, most of the ones who loved to party in their spare time also worked on the side, or at least volunteered answers in class regularly and did their work. While it varies from school to school, the number of students who just coast through college life, never working during school or taking on summer jobs or applying themselves in classes, seems to be on the decline. “I work hard, and I play hard,” a male undergrad (and proud partier) told me when the issue came up. When I started college, my class was told by the speaker at orientation that we were the most talented and most hard-working class they’d ever had, with more of us engaging in extra-curricular activities, working or raising families while attending school than any previous year. Well, they said that about the class after us, too, and probably the class before. In general, college students of the last 10 years are just not like students in the decades before. So why did the speaker sound so surprised? Ah, good old stereotypes, forgetting that all things change. Well, most things, anyway. As college and graduate students work harder for the ability to obtain their degrees and juggle more, the issues they have to deal with in order to be successful students begin to carry an extra sting. The price of higher education keeps on rising, textbook costs remain outrageous as editions get chucked out in favor of minimally changed new versions, and there’s always that one professor who gives out assignments like theirs in the only class students are taking. Though times have changed outside the college campus, these basic issues in higher education have not. 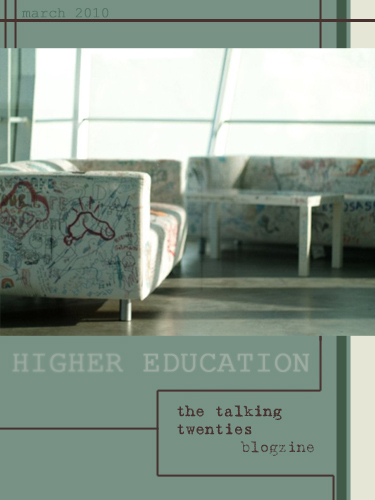 That’s why The Talking Twenties will be discussing those issues and more this month. We hope you’ll join in the discussion, too.